Please look at the pictures. Book is great condition with a small crease in lower left corner. Binding look pretty clean ,a very small tick. With Stan Lee's heart-breaking passing, one thing remains clear: there are now only a fixed number of Stan Lee signed comics available. What's left of his signature is what is on the planet currently. DOCTOR STRANGE #75 MARVEL COMIC . Shipped with USPS First Class Package. Check pictures for condition if you need more pictures of the comics just message me and I will do my best to help. Shipping: Combine shipping on comics will be $1. Lots will also be $1 per lot additional. This lot includes issues 23, 44, 45, 48-55, 59-62, 73 and the Doctor Strange / Ghost Rider special. Most are bagged and/or boarded. This book is professionally graded by the CGC. This comic has a grade of 9.8 and has WHITEPAGES. We recently obtained a large collection of comics! 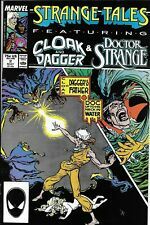 STRANGE TALES Vol.2 #1 1987 CLOAK & DAGGER + Doctor Strange NEWSSTAND VF 8.0. Here is Strange Tales #1. Condition: VF 8.0. Just love Brunner art …… I combine at 50 cents each extra book all from my collection of Dr strange began when I was a lad. I could never get 110 until 10 years ago. Ungraded, but comics are FN/VF and above. Origin of Umar. Writer: Roger Stern. Books are in the VF range. PUNISHER APPEARANCE. Strange Tales Vol.2. MARVEL COMICS. Book is in NM- or better condition! BUY MORE and SAVE! This copy looks decent at FN/VF. Ungraded, but comics are FN/VF and above. Artist: Paul Smith. Script: Ann Nocenti Pencils: Tony Salmons Inks: Tony Salmons. Cover Tony Salmons. Dr. Strange / comic story / 22 pages. --- - -----from Marvel from 1984-----------------. I grade as accurate and tough as possible-. This issue has been previously read and remains in Very Fine/Near Mint Condition. Doctor Strange (1988 3rd Series)#22. Doctor Strange (1988 3rd Series)#23. The item for sale here is Doctor Strange #22 & 23. I have included close up photos so you can see it's condition for yourself. Dormammu has taken over Doc's body and calls the other black sorcerers to follow him. Doc, Clea, and Topaz fight Dormammu so that Doc can have his own body back. Doctor Strange / comic story / 27 pages. This copy looks decent at VF- to VF. Doctor Strange (1988 3rd Series)#24. Doctor Strange (1988 3rd Series)#25. The item for sale here is Doctor Strange #24 & 25. I have included close up photos so you can see it's condition for yourself. This copy decent at FN/VF. Cover by Gene Colan. 36 pgs., full color. Doctor Strange (1988 3rd Series)#18. Doctor Strange (1988 3rd Series)#19. The item for sale here is Doctor Strange #18 & 19. I have included close up photos so you can see it's condition for yourself. Doctor Strange (1988 3rd Series)#20. Cover by Jackson Guice. The Book of the Vishanti The Mark of the Vodu Part III, script by Roy Thomas, Jean-Marc Lofficier, and Randy Lofficier, art by Geof Isherwood; The origin of the first Brother Voodoo. Story continued from Strange Tales #19. White Pages. Cover Al Milgrom. Doc and Clea get "married". Doctor Strange with eyepatch; Will Fanshawe has a copy of Galactic Patrol by E. E. "Doc" Smith in his back pocket. Doctor Strange / comic story / 24 pages. "Nightflight!". Story by Bill Mantlo. Art by Brett Blevins and Al Williamson. Cloak's disturbed dreams attracts the dream demon known as Nightmare. Can Cloak and Dagger defeat this powerful force for evil before the jet airliner they are on crashes to the earth?. We stand behind all of our books. We recently obtained a large collection of comics! Doctor Dr. Strange Sorcerer Supreme 31 & 32 Cameo & 1st App Nyx / Nox Newsstand. Shipped with USPS First Class Package. Please email with any questions and bid with confidence from my great feedback. Doctor Strange #15 Amy Grant Controversial Cover Marvel 1990. Condition:NM 9.4. 38 - Feb 1992. 23 - Nov 1990. 26 - Feb 1991. 28 - Apr 1991. 22 - Oct 1990. Issues include 16 - April 1990. Original owner. Never read, never opened, new in shrink wrap. Perfect condition. Sharp corners. (See photos). DR. STRANGE Sorcerer Supreme #31 Marvel Comics 1991 CGC 9.6 (NM+) !! Spectacular Spider-Man #115 DR STRANGE X-OVER NM 9.4! VENOM / BLACK COSTUME APP!